2018/2019 Preschool Year Started August 8, 2018 and will end May 14, 2019. School Tours: In order to minimize interruptions to our current classes and students, we will not give weekly tours during the months of January and February. Tours will be given on the following dates: Monday, January 22nd, Wednesday, January 30th, Monday, February 11th and Thursday, February 14th; all are drop-in between the hours of 9:30-11:30, no appointment necessary. Registration for the 2019/2020 Preschool Year: Registration is now open to the community. The first month's tuition and a registration fee are due at the time of registration. The first month's tuition is refundable with a 30 day written notice of withdrawal from the program. The registration fee is not refundable. There are openings in the 4-day Three-Year-Old Class and the PreK Class; all spots have been filled in the 3-day Three-Year-Old Class and the Two-Year-Old Class. To provide a positive, safe, happy environment where a child will be able to experience success. To provide hands-on leaning with a Bible/theme based curriculum through art, music, creative play, Bible stories and verses. To build skills for kindergarten readiness. To satisfy a child's need to find out, the need to belong, and the need to feel secure in God's plan for us. Bringing people in our community to Jesus through their children. Educating children about God's love. Ministering to our church and community through the children's programs. Having our children spread the good news of Jesus Christ to the community. Having our children worship together with their families and community. Each class follows a schedule that includes time for music, movement, art, Bible stories, crafts, snacks, circle time, centers, outdoor play time and academic instruction. There is a school-wide theme, color and shape of the month. We use the Zoo-phonics academic curriculum, and our Bible education curriculum studies one Fruit of the Spirit (Galatians 5:22-23 ) per month. We have a student body of 62 and staff of 13. All staff members must pass a criminal background check and take classes in CPR and First Aid. In general we follow the Cobb County Schools' schedule with a week later start date, 2 extra days for Christmas break and a week earlier end date. School Tours: From May 16, 2018- August 10, 2018: by appointment. From August 13, 2018- December 6th, 2018: Tuesdays, 9:30-11:30am (drop in between these hours, no appointment necessary). During the months of January and February: January 22nd, January 30th, February 11th and February 14th (drop in between the hours of 9:30 and 11:30am, no appointment necessary). March 5, 2019- May 2, 2019: Tuesdays 9:30-11:30 (drop in between these hours, no appointment necessary). Other times by appointment. Registration for the 2019/2020 preschool year is now open to the community. A non-refundable registration fee and the first month's tuition is due at the time of registration for new families. The first month's tuition is refundable with a 30 days written notice. The registration fee is non-refundable. Maximum class size is 14. 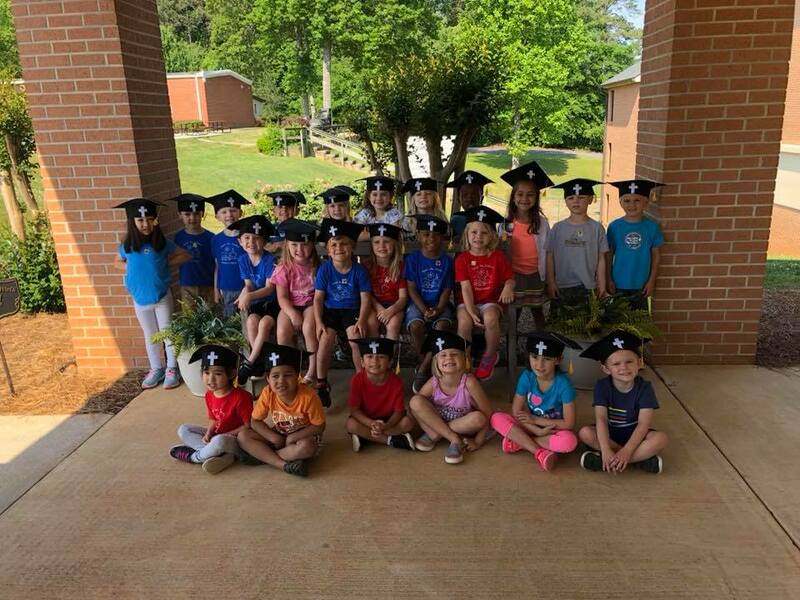 3 day, 3 year old class (3B): This class has filled for the 2019/2020 preschool year. Please contact the preschool if you would like to be placed on the waiting list. (2's Tuesday/Thursday): This class has filled for the 2019/2020 preschool year. Please contact the preschool if you would like to be placed on the waiting list. Optional lunch bunch from 12:00-1:00pm. There is an extra charge of $4 per lunch bunch. Students bring lunch from home.